There are lots of different ways interpret earth colours, once you start to think about it. They can be the colours of the landscape - browns, greys, yellows, oranges and greens. The colours of nature, subtle and muted. Or you have your pigments - ochre, sienna and umber, raw or burnt - those tones are fiery, saturated and heavy with colour. But the earth colours that I'm really savouring right now are the ones that were dug up out of the earth and turned into lunch. September is the month of abundance and harvest, of enjoying the last of summer while taking stock and gathering in for the autumn and winter ahead. 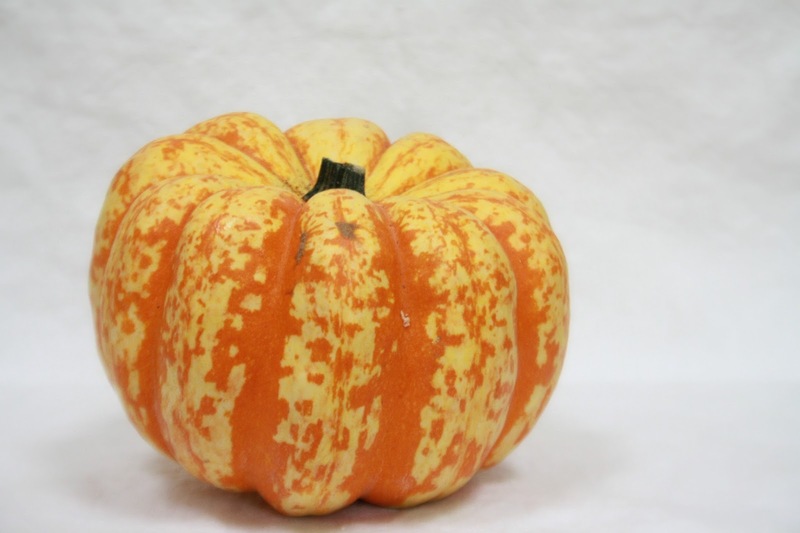 I think this is summed up rather well by the humble squash, in particular this fabulous Harlequin squash. It has provided colour and variety in our lunches this week. Roasted and tossed in a salad with goats cheese and pumpkin seeds one day, then blended with chillis and eaten in a soup with rye bread the next. To make a salad for two, peel and dice one small squash. Tumble onto a baking tray and drizzle with oil and season. Roast for around 30 mins at 180°C/350°F. Put some salad leaves on a plate and add the squash, some crumbled goats cheese and a handful of pumpkin seeds. I made a quick dressing from a little balsamic vinegar and olive oil. Eat while it's hot. For the soup, peel and chop one onion and one squash. Saute for a minute or two then add one clove of garlic and one chilli, chopped. Cook a little longer then cover with vegetable stock and simmer for around 20 minutes. Puree in a blender until it's smooth then taste and season. Serve with a dollop of creme fraiche. It doesn't have to be a Harlequin squash, any sort would do. Simple, versatile, thrifty, tasty and colourful, it's the best kind of seasonal food. Lovely looking soup, and such a pretty squash! I love the ones that are multicoloured. Yum, that salad is making me drool! Oh gosh Gillian - I love your Harlequin soup...a taste of the earth and Autumn. What a beautiful squash. I really must grow something like this next year. Your recipes look absolutely delicious. Both meals look and sound delicious! Yum! Writes the woman who had two cappuccinos for lunch today ... think I need to get a grip! I love these collaboarative posts, Gillian. September is the month for 'humble' offerings - soup, stew, crumble. All from the garden if you are lucky. Great post and photos. I really like the look of that salad. I love roasted squash and soups made from squash. I often serve a soup like that on Thanksgiving. I cooked the first squash of the year yesterday (with chickpeas, honey and spices).It was a butternut but I shall be on the look-out for a harlequin. Tasty and nutritious what more can you ask for ! Being lazy about cooking at the moment being on my own, but this is so simple that I don't have an excuse! Beautiful photos and I love your take on the produce of the earth. Plus, that soup looks wonderfully tasty and comforting! As well as great colours, it seems to me that September has dibs on all the best food! Just caught up with all your posts from this last week, not sure where the time is going at the mo but for once its not being idled away on line! I'm sure the little hampers of edible goodies will be very happily received and if you keep your eyes peeled in the supermarket for special offers you could add some little things little crackers to go with them, but homemade cheese straws would be another nice little touch. Well done on the jelly strainer find, funny how these things pop up! I read a post on a blog the other day which used pureed butternut squash in stirred into a cheese sauce as a way of getting another veg into a meal without necessarily noticing it was there. I did this on Sunday in a chicken and cauliflower and broccoli bake and it was wolfed down with second helpings!